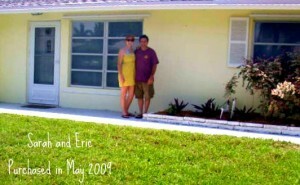 Eric and Sarah had one goal – to escape the cold winters of Maine and spend time in sunny south Florida. As avid sailors, they had been to Stuart twice and knew that this town was the place for them – the closer to the water the better. We hit it off well from the beginning and had a great time over two seperate weekends touring condos, duplexes, and townhomes that were within their price range. The moment we drove down the street to one duplex that was on our tour list to see, they knew it was “the one.” There was no picture of the property on the MLS so we were a little concerned that it wasn’t in good condition but we quickly found that it was everything that they needed. The bonus? It came with a boat slip on the St Lucie River!! This duplex was about 4 houses in from the river and came with a slip right on the end – big enough to house their sailboat. The duplexes on this street don’t go up for sale often and we were lucky enough that this one was an estate sale so we were working with a regular seller and not the short sale or foreclosure process. Eric and Sarah aren’t planning on moving down right away but the big success – to me – is that we became great friends and we’ve already broken the home in with margaritas when they were down a month after closing. Cheers to Eric and Sarah!